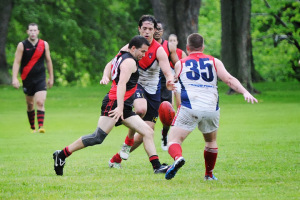 Toronto Dingos Div.2 began their 2013 campaign with a 16-point win against the High Park Demons at a rain soaked Humber South last weekend. Leading at every change, the Dingos kicked away in the second half with two late goals by Irish team manger Gary Conlon. The Dingos opened up their account with a fine shot from Robert Fitzhugh. The tall Irish man pulled away from a contest to kick a well worked team goal. Andrew Crawford, Fitzhugh and Pat O’Shea linked up well to cause the Demons defense all sorts of problems with Crawford unlucky not to score a few times himself. Dingo veteran, Steve Lanning, won and dispatched the ball to all parts of the ground. Towards halftime the Demons began to build up momentum, applying pressure in the mid field. The Demons attack was met by ferocious half back Kristian Frantzen who swallowed up each play, with rovers Roman Belli and Alvin Ranchhod cleaning up effectively around him. Ranchhod was in fine form, mopping up everything in the centre with an admirable work rate of contests, marks and creative play resulting in a goal for his efforts. When the Demons did get through full back Steve Gordon put in a dogged display to nullify their goal attempts at every turn and was probably one of the main reasons the Demons only scored 2 goals all game. The second half became a real battle as fatigue and the wet slippery conditions wore both teams down. The Demons kicked a goal which saw them climb up the score board but the Dingos regained their composure. A second half appearance from Dingos Legend Mick McFarlane, saw him take control of the play. A great attack down the flanks, which began with new Aussie Ryan Cross winning the ball from half back, found Dan Prior in open space to blast home the Dingos third goal of the game. The attack continued when Gary Conlon, linking well with the midfield, slotted a perfect goal from a difficult angle for the fourth Dingos goal. Good pressure again from O’Shea saw the ball drop inside the Demons half to be picked up by Conlon to score his second goal of the game and ensured their first win of the season. A combination of pressure and quick delivery saw the Dingos to victory, a true team effort with some notable performances. Goals: G. Conlon (2), Alvin Ranchhod (1), Dan Prior (1), Robert Fitzhugh (1).